Hermes Business Messaging Gateway is a proven open-source solution for enterprises to automate business transactions with business partners through secure and reliable exchange of electronic documents (e.g., purchase orders). Hermes is secure; it allows you to encrypt and digitally sign the documents for transmission. 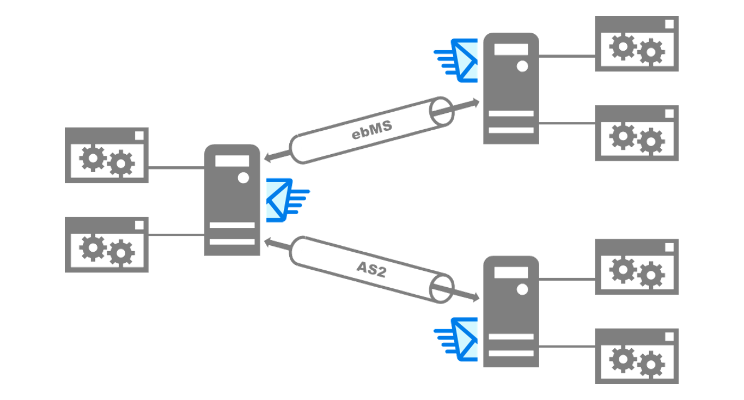 Hermes is reliable; the sender can automatically retransmit a message when it is dropped in the network while the receiver can guarantee every message is delivered once and only once, and in the right order. Electronic Data Interchange (EDI) was developed as the de facto standard for organizations to exchange business data. EDI is running on private networks and based on a cryptic protocol, which makes implementation complicated, expensive, and flexible. These disadvantages have limited the EDI usage to very large organizations only. Hermes is designed to use the Internet, Public Key Infrastructure (PKI), and XML technologies to replace the EDI as a more affordable and extensible solution. Hermes supports mainstream business-to-business (B2B) transport protocols, such as ebXML Message Service 2.0 (ebMS 2.0) and Applicability Statement 2 (AS2). (The ebMS 3.0 / AS4 support is currently under development.). Hermes unifies different transport protocols into a single B2B messaging framework. Based on this framework, you can easily develop an enterprise application to exchange business data with trading partners via different transport protocols. Designed to be extensible, Hermes provides an open Simple Plug-in Architecture (SPA) for developers to implement new messaging protocols as plug-ins. Most importantly, Hermes is open-source; you can freely extend Hermes and integrate it with other systems to meet your own business needs. © Copyright 2016, Center for E-Commerce Infrastructure Development, The University of Hong Kong. Revision 8d2487c0.